October 9, 2015 By This post may contain affiliate links. 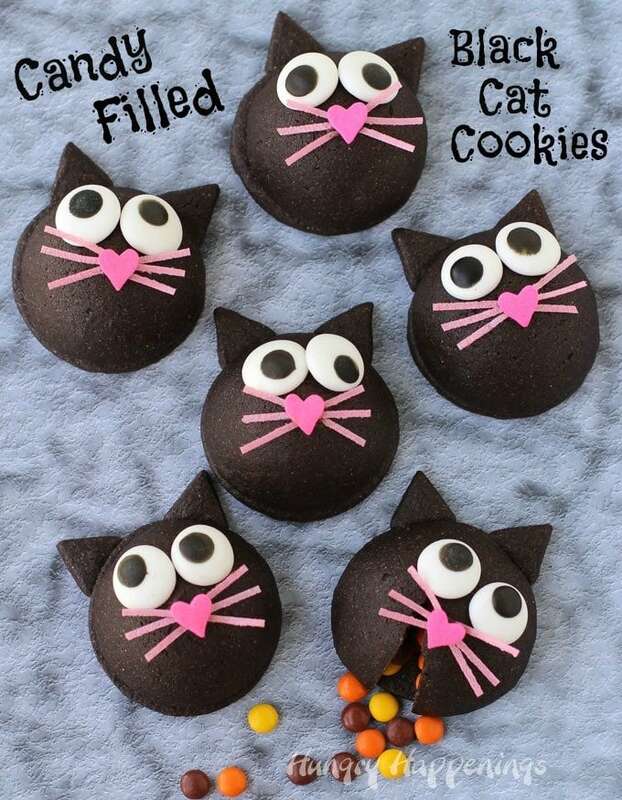 These wickedly cute Candy filled Black Cat Cookies will make the purr-fect Halloween treat. Each dimensional chocolate cookie is both decorated and filled with candy. These wide eyed cats may not be exactly what you’d typically associate with witches at Halloween, but I just couldn’t resist making these cookies sweet looking instead of sinister. Black cats are usually associated with dark magic and by some are considered evil. I lived with a beautiful black cat who would curl up around my head and lull me to sleep with her purring. She couldn’t have been more loving, but was definitely a scaredy-cat. She ran and hid when humans crossed her path. 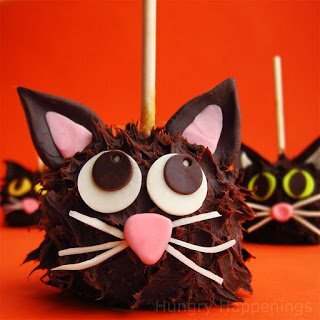 I personally think cats are adorably cute and love that they have a really simple shape which is perfect for making edible crafts. I didn’t even need a cat shaped cookie cutter to make these cookies, just two round and one triangle cutter. Two small triangle ears were added to one round cookie and baked flat, then another round cookie was baked over the top of a cake pops pan to give it a half sphere shape. I liked that by using just round cutters, I could get the two cookies to line up almost perfectly, unlike the Candy Filled Cauldron Cookies I made the other day. The cauldrons had more flat cookie around the outside than I would have liked, but I used the smallest cauldron cutter I could find. These cats, however, worked out perfectly and looked just like I had envisioned. If you prefer a more spooky looking cat, you can easily change out the candy decorations and use green candy eyes instead of white ones, a chocolate chip nose instead of a pink heart sprinkle, and maybe some black colored licorice whiskers instead of the pink edible Easter grass that I used. If you just said, “eww, gross,” when you read, black licorice laces, you might be happy to note that Wilton makes fruit flavored black colored laces. As much as I love the flavor of black licorice, I think the fruit flavored laces will taste much better with a chocolate cookie. 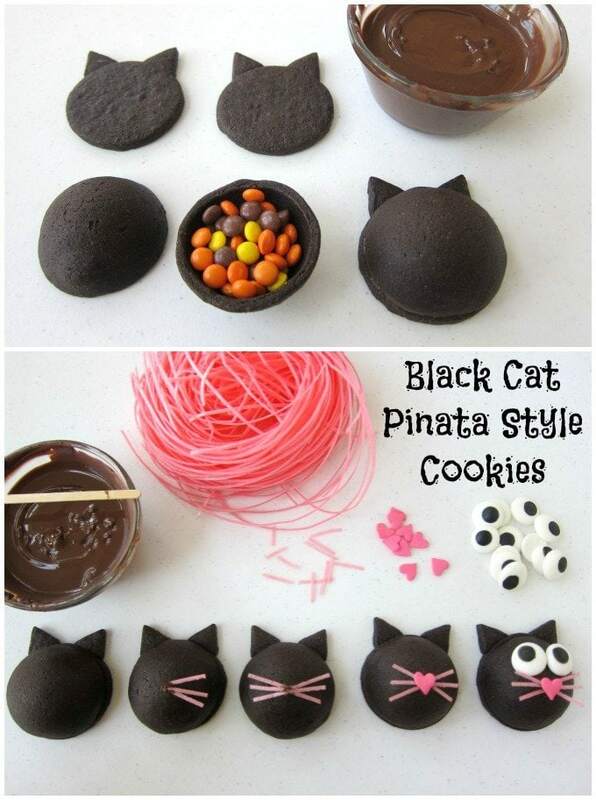 Either way you decorate your own Candy filled Black Cat Cookies, I’m sure they will put a spell on your friends and family. One that makes them grin from ear to ear. Now that’s my kind of magic. 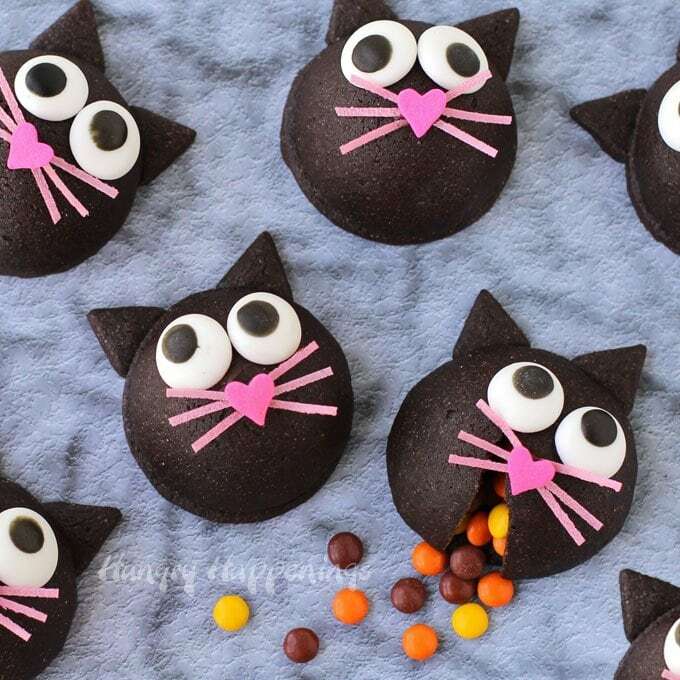 Wickedly cute black cat cookies filled with candy. Combine cocoa powder, baking powder, salt, and flour in a small mixing bowl. Flatten dough into a disc and wrap in plastic wrap or place in a zip top bag. Roll dough out to 1/8 inch thickness. 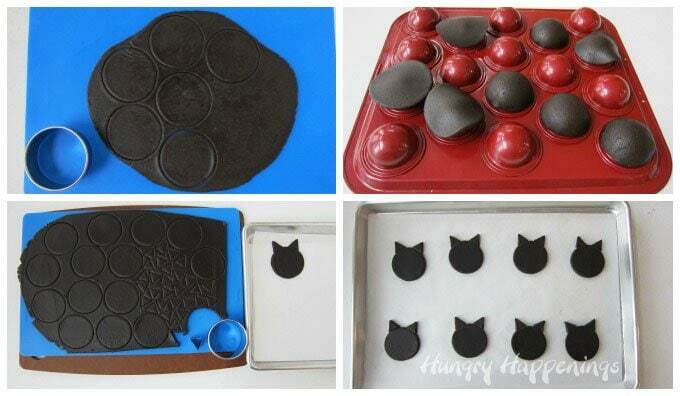 Cut out 22 circles using a 2 1/4 inch round cookie cutter. Cut out 44 small triangles, for the cat's ears. Set the round dough on parchment paper lined baking sheets. Brush the bottom edge of each triangle with a little water, then press two of them onto each dough round. Bake cat cookies for 10-12 minutes until the edges are set. Cut out 22 circles using a 2 1/2 inch round cookie cutter. 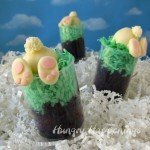 *If you can’t find the edible pink Easter grass, you can use fondant, modeling chocolate, or licorice laces. You could even pipe chocolate whiskers. 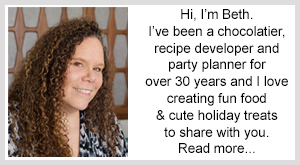 **The Telebrands Cake Pops pan I used makes large cake pops and requires 2 1/2 round to cover it, leaving just enough room for the dough to expand during baking. If you use a different brand of cake pops pan, you may need to adjust the size of the round cutters to use. I know some pans are smaller. Make the cookie dough, refrigerate it for an hour, then roll it out to 1/8th inch thickness on a silicone mat. Use a 2 1/4 inch round cutter to cut out 22 cookies. I find it easiest to peel away the excess dough, then pop the cut out cookies in the freezer for about 5 minutes. Then they are easy to peel off the silicone mat. Set the rounds on a parchment paper lined baking sheet. Cut 44 small triangles out of the dough. I used a small triangle cookie cutter, but you can hand cut them with a knife. Brush one edge of the triangle with a bit of water and attach two triangles to each round of dough, making cat ears. Bake for 10-12 minutes. It’s always hard to tell when chocolate cookies are baked, but the edges of the cookie should begin to set and look a bit lighter in color. If the tops of the cookies look really shiny then the cookies need a bit longer in the oven. If you like really crispy cookies, bake them for 14 minutes. Then roll out the remaining dough thinner, about 1/16th inch thick. Cut out 22 circles using a 2 1/2 inch round cutter. Remove the excess dough, and pop the mat in the freezer for about 3 minutes. Peel the dough round off the mat and set each round over the tops of the cake ball pan. Smooth out the dough curving it over the domed pan. Pop the dough covered pan back in the freezer for 15 minutes. Then put the pan on the bottom rack in the oven and bake for 7-9 minutes until the edges look set. To assemble the cookies, you’ll need some melted and tempered chocolate or candy melts. 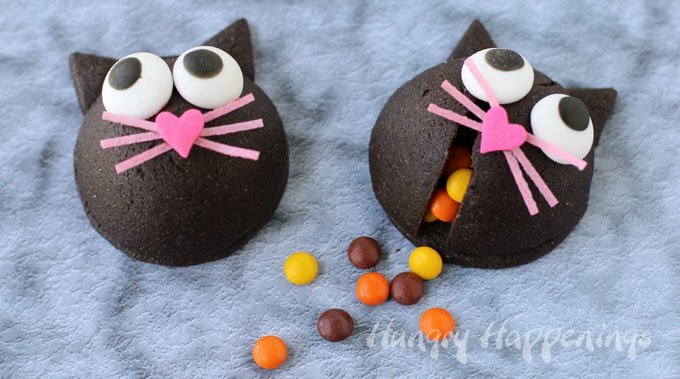 Fill the half sphere cookies with candy. 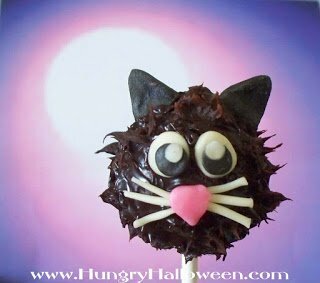 Paint a thin layer of chocolate around the top edge of one domed cookie, then turn a cat cookie upside down and set it on top of the domed cookie. Hold it for a minute until the chocolate sets. Repeat, attaching all the cookies together. Cut the edible pink Easter grass into short whisker pieces, about an inch. 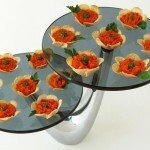 Attach 6 of them to the center of each domed cookie using the melted chocolate. It’s easiest to attach 3 on one side, let them dry, then add the other three. Otherwise, they move around too much. Attach a pink heart nose over top of the center of the whiskers. 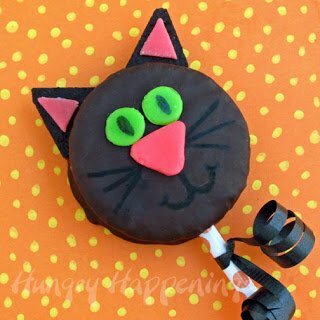 When you serve these Black Cat Cookies for Halloween, your friends and family can crack them open to reveal the candy hiding inside. What a treat. 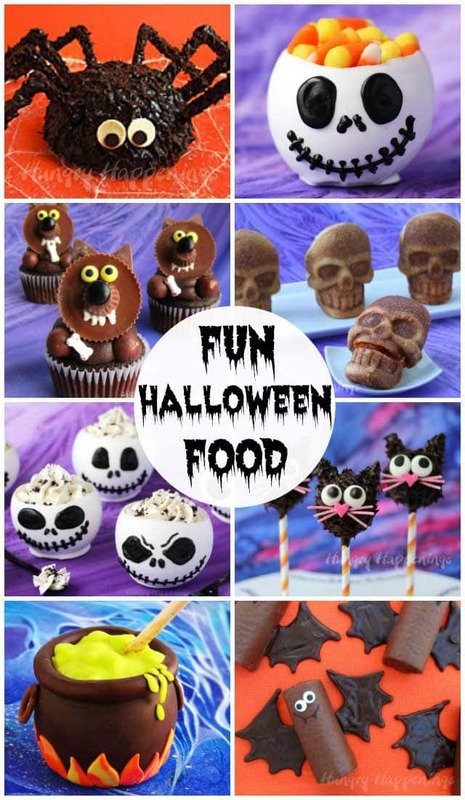 If you are searching for more festive Halloween treats, check out all my Halloween recipes by clicking this link. 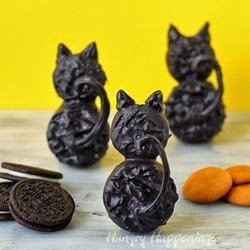 Here are a few of my favorite black cat treats. So cute and such a clever idea! 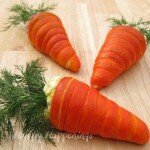 I love this idea for Halloween! 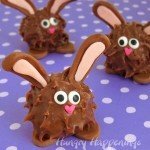 I love these pinata style treats. They are always so much fun to bite into! You always outdo yourself Beth! Thanks so much Abeer! I love making pinata cookies and my friends really get a kick out of them. Those black cats are definitely too cute to spook!! 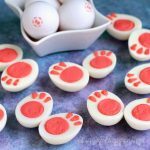 These kitty cookies are adorable and must be delicious and fun to eat! 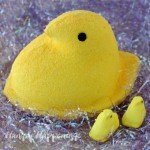 These are adorable, Beth! You are so talented! Thanks. I’m getting things ready for our party and these cats will look so cute on my table!